The comedy never ends with Israel. When trawling the news I noticed in the Jpost THIS article where AIPAC’s former chief Steve Rosen is defending Nozette, the "latest" to spy on America. Rosen claims the FBI and CIA are “Paranoid” about Jewish spies. That would be the very SAME Steve Rosen accused of spying on America for Israel. You can read about HOW and WHO, helped Rosen and his pals to escape the charges HERE. And of course Nancy Pelosi's contribution HERE. Now, I’d have thought that any number of the following “public events” would have troubled AIPAC and Israel: Like exposing ties to the Democratic Party here, or the declassified information which shows even more spies here, or how Israelis scam elderly Americans here, or perhaps the Freeman Affair here, or even the exposure of how American’s are loosing jobs because of AIPAC here. But none of these incidents troubled AIPAC or Israel in the least. The real issue and problem which is getting AIPAC in an uproar is the fact that the majority of Americans, and most likely this includes the CIA and the FBI are becoming a bit fed up with America’s “Best Friend” one way relationship. Its one thing to control our Politicians with bribes, scam our elderly, get busted in New Jersy for stealing kidneys and money laundering for Israel. However “spying” is a totally different “Kettle of Fish” altogether! It’s like finding out your best friend has been hacking into your emails, checking out your bank statements, reading your personal diary, rummaging through your drawers and snooping into all your personal areas, eavesdropping on personal conversations you have with your spouse, and even planting hidden cameras in your house. That’s crossing the line for Americans. And the fact that this is NOT the first time, but one in a long line of “spies” sends a very clear message to the American people. "Fool me once, shame on you, Fool me twice, Shame on me!" And this is what worries AIPAC and Israel. The American people, the voters, those people whose views matter. Charges of espionage against US Defense Department scientist Stewart Nozette reflect "extreme views" against Israel that could harm US-Israel relations, former AIPAC staffer Steve Rosen told The Jerusalem Post on Tuesday. Rosen, AIPAC's former foreign policy chief who was accused, with Keith Weissman, of passing along classified information, said it was revealing that Israel was inserted into the narrative of Nozette's entrapment and subsequent arrest. The case against Rosen and Weissman was dismissed last spring. "One of the things that our case revealed is the very extreme views that are held by some in counterintelligence agencies of the CIA and FBI about Israel," Rosen said. "They believe that the Mossad spied on the US on a huge scale and they believe that the Pollard case was the tip of some sort of iceberg. 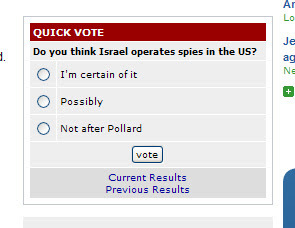 "When you keep repeating that the Mossad is spying on America, Israel is harming the United States, of course it harms the alliance between Israel and the US,"
Where even the majority of Israelis believe that Israel spies on America all the time. So even the Israelis don’t believe AIPACS “hasbara” or even their own government! And if this is what Israeli’s think, it’s not far fetched to imagine that Americans believe the same thing and much more about Israel…………..This is Israel’s elephant in the room. The regular American people, their opinion of Israel matters, without their support for Israel is toast! Bring on the Butter! I am just wondering why didnt you respond anything to my coment from the topic:"ISRAELI SPY CASE, NOT ADDING UP"? Saladin I will respond, today has been very busy for me. I have been in and out all day and it's getting late now. weather, but with realy good people. I hope, You have Ateists in Ireland! 1. Comments accepted for one week only, posts older than one week, comments will be rejected.